Iranian-Americans, or Persians, are over 1,000,000 strong and growing - but have virtually no representation in almost any office nationwide. This year, Leili Fatehi and Mitra Jalali Nelson are Iranian-American women launching historic candidacies at a time when our very communities are under attack. Join us to support new political leadership for a more progressive politics that will stand up for us all. Learn more about the candidates below. Mitra is a former teacher, political organizer and now policy & outreach aide to US Rep Keith Ellison. She is running for Ward 4 City Council in Saint Paul to push for progress on affordable housing, building community wealth and police accountability. 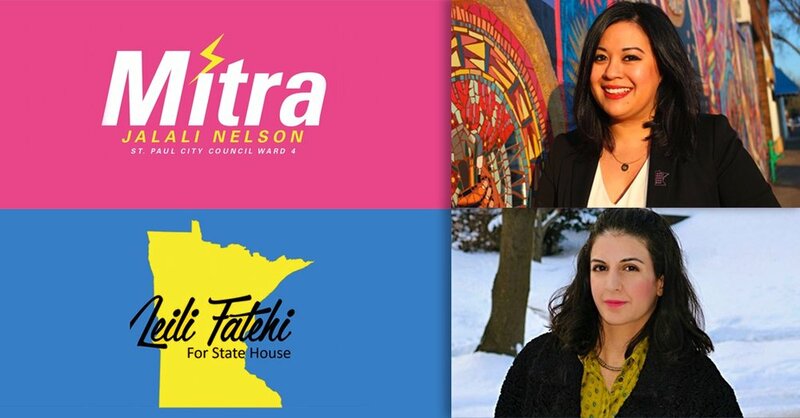 Leili Fatehi is running to represent Minnesota’s House District 63B. An environmental lawyer, business owner, and advocate for equity, opportunity, transportation, education, and more, Leili is running for Minnesota’s State House because she wants to deliver collaborative solutions that address persistent inequities faced by Minnesotans state-wide. به ما بپیوندید برای حمایت از خانم میترا جلالی نلسون (کاندیدای حوزه چهارم شورای شهر سینت پال) و خانم لیلی فاتحی (کاندیدای بخش 63 ب مجلس ایالتی مینه سوتا). بیایید تا با آغوش باز از این دو بانوی پرتلاش ایرانی-آمریکایی که برای پیشرفت جامعه بپاخواسته اند، استقبال کنیم.